This darling baby blanket design will definitely be loved by Mom & baby for years to come. Baby's name is spelled out in embroidered "beads" to resemble the old-fashioned baby bracelets that used to be put on newborns in the hospital! Blankets may vary in style, but will be oh, so soft! 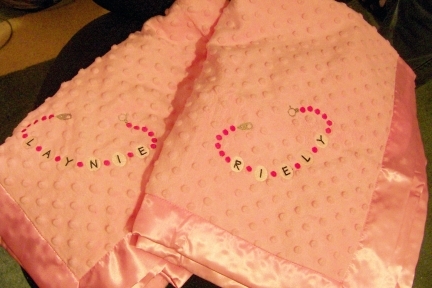 Blankets shown are made of super soft minky dot fabric with a satin back & binding.